Adobe Illustrator is one of the tools loved by many designers. It has a lot of powerful features that make design processes easier and a lot faster. One of these features is graphic style, which can bring wonders to designers’ projects in instant. Graphic styles allow designers to swiftly change the look of texts and shapes with just one click. 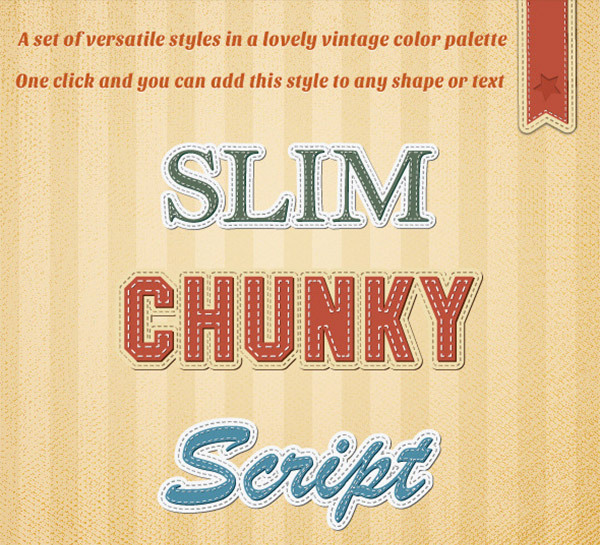 This retro and vintage text styles gives you a quick & easy way to apply high quality, old-style design to your text at an affordable price. Scroll down and check out the collection below. Come, take a peek, and choose your pick. This first feature gives you four styles for a fraction of their price. 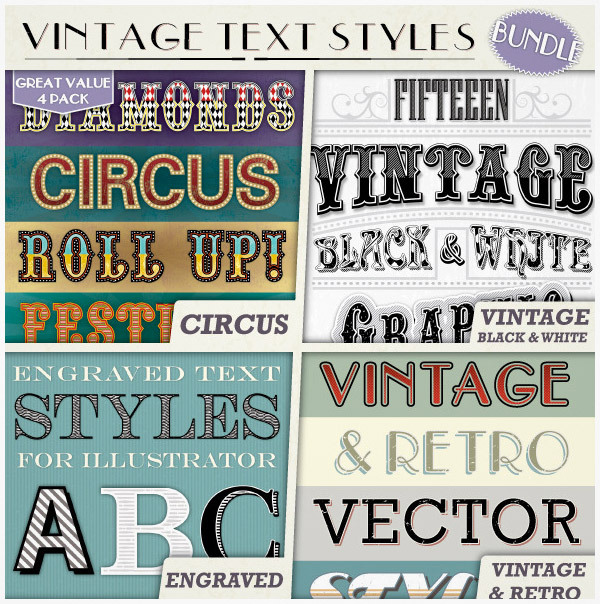 It includes vintage & retro, circus text, black&white, and engraved vector text styles. The patterns are includes as well and they can be used separately. 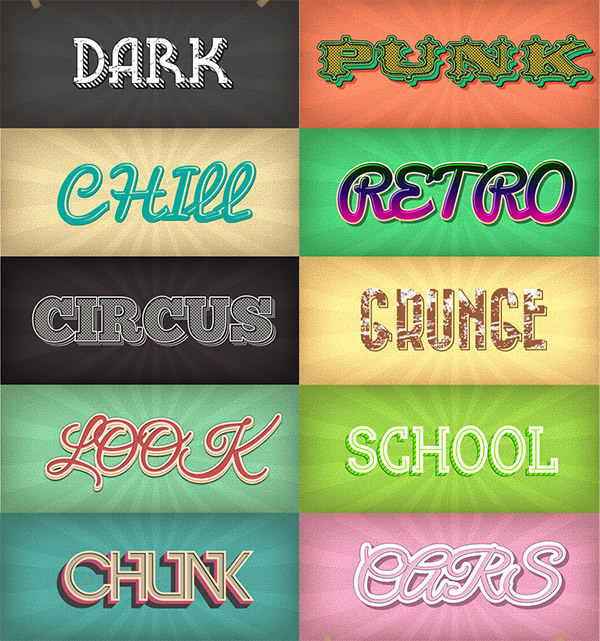 The AI file comes with 10 various text styles and 10 backgrounds AI files as well. They are compatible to Adobe Illustrator CS3 and later versions. 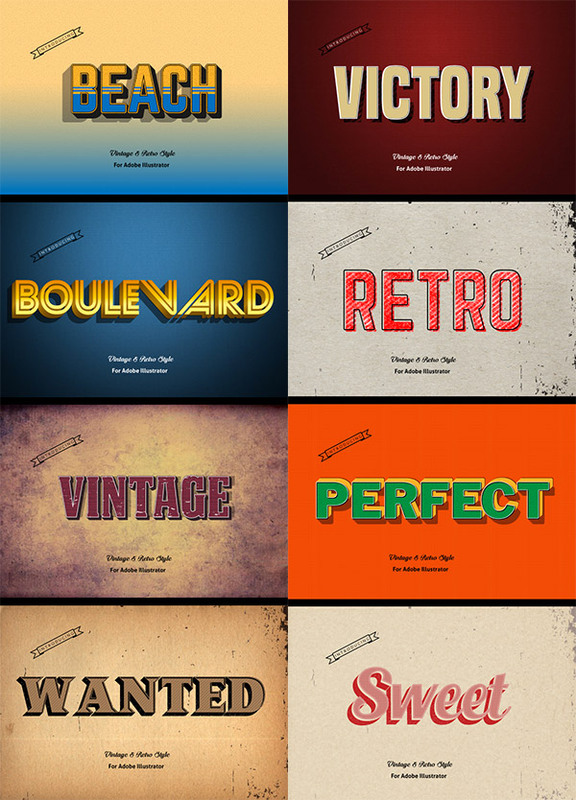 This Retro text styles also come in 10 designs that can be great for posters, flyers, typography, website banners, magazines, and more. 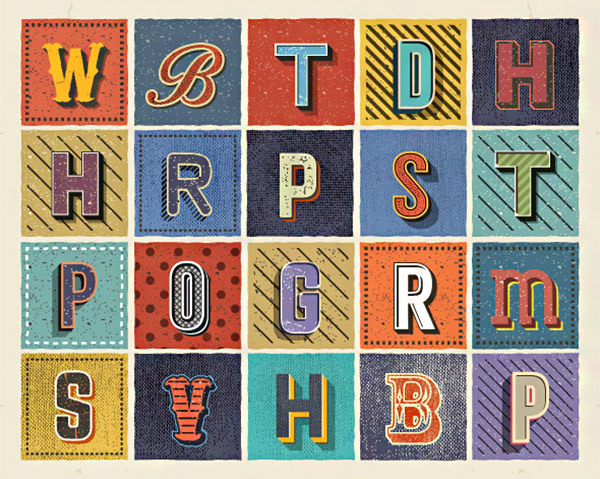 It comes in 1 AI file with 10 styles for Adobe Illustrator CS5 and later versions. It comes with help file for assistance in using them. 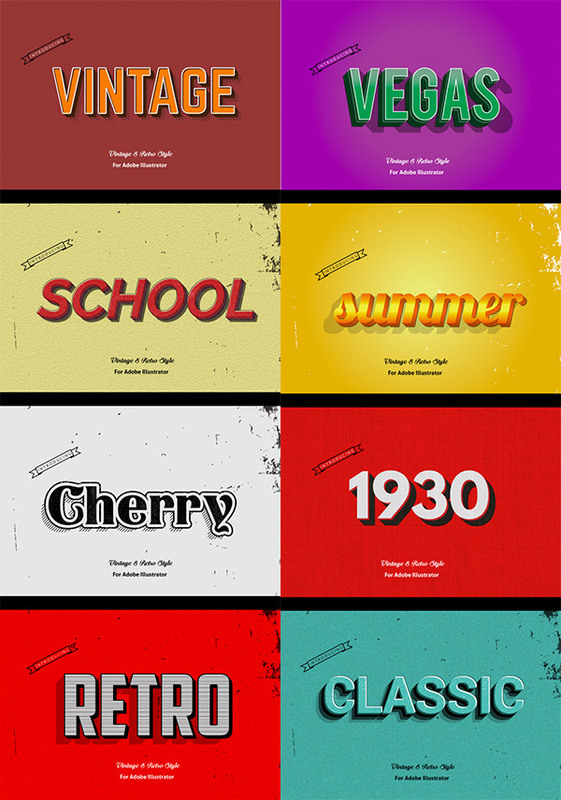 Time travel your design back to 1980 with these 15 text styles that are compatible to Illustrator CS5 to later versions. 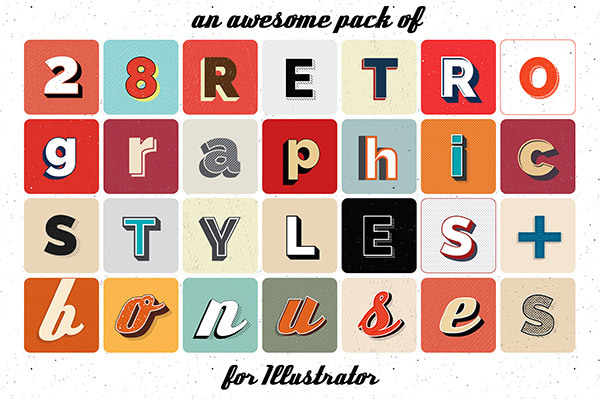 This pack contains AI and EPS files with a help file to help you use these 6 styles. 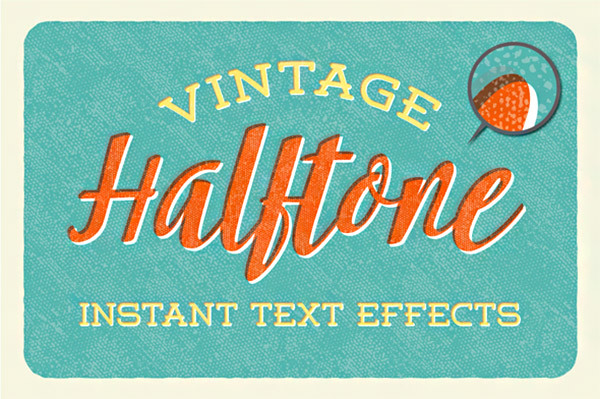 Retrotype is a set that contains 26 Graphic Style for Adobe Illustrator that enable you to instantly add retro text effects to your vector designs. They comes in AI and EPS formats. 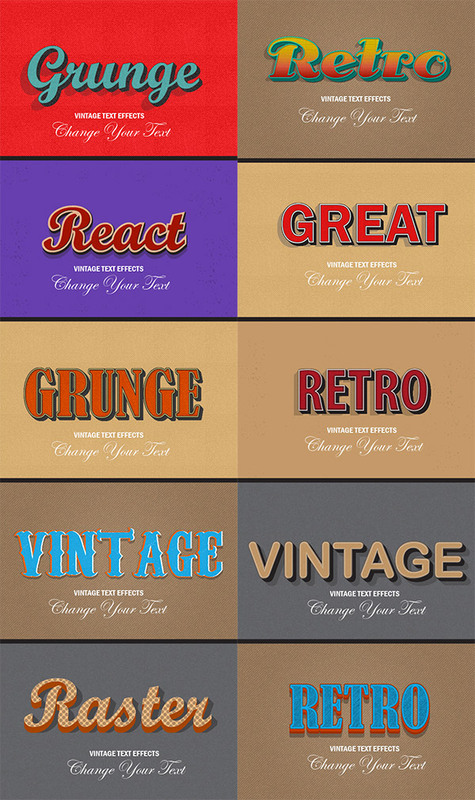 This is a pack of 10 different vintage and retro graphic styles that are suitable for web designs, posters, typography, and other graphic designs. 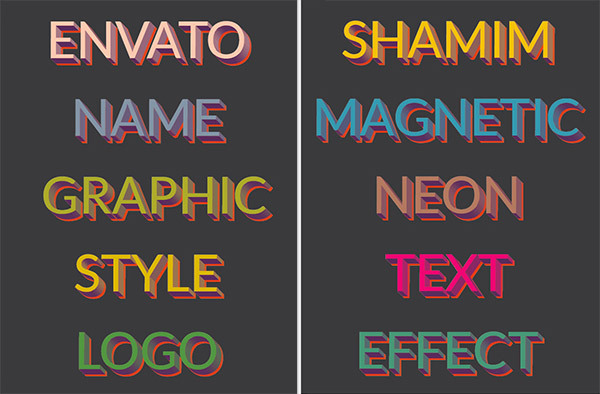 This set offers geometric effects that will definitely add eye-catching assets to your texts. 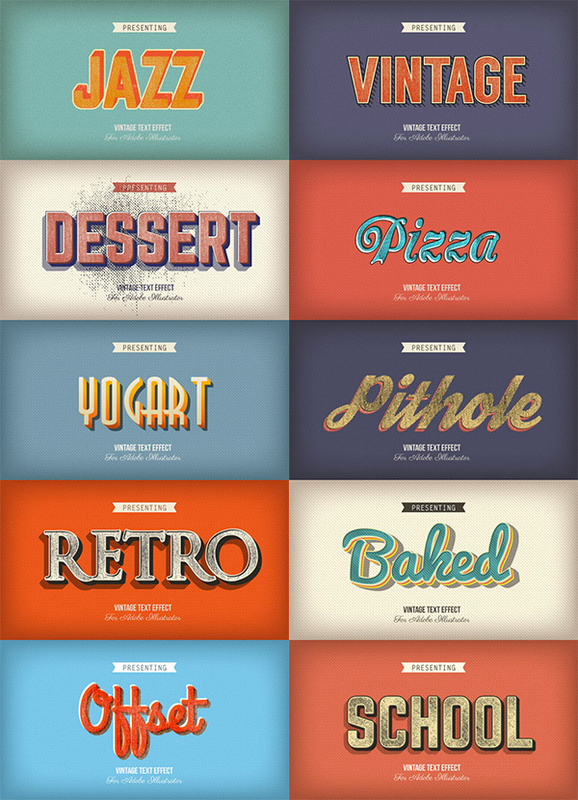 It comprises 30 styles to choose from that are compatible to CS5 and later versions. 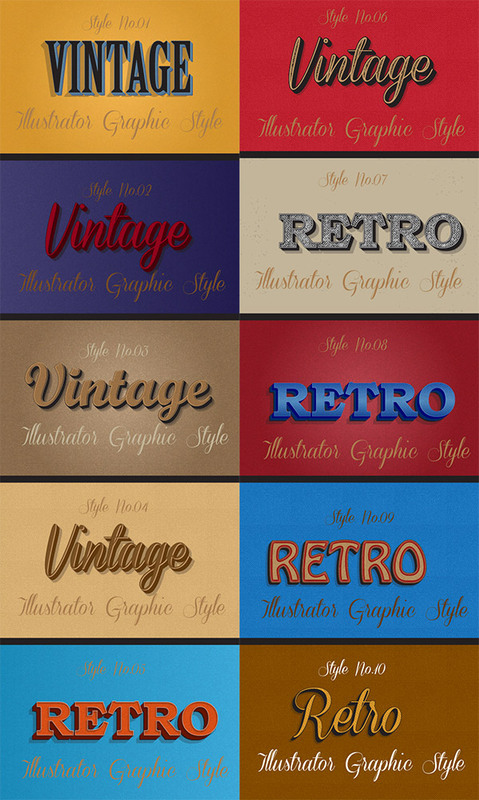 This is a pack of 10 different vintage and retro graphic style for Adobe Illustrator. 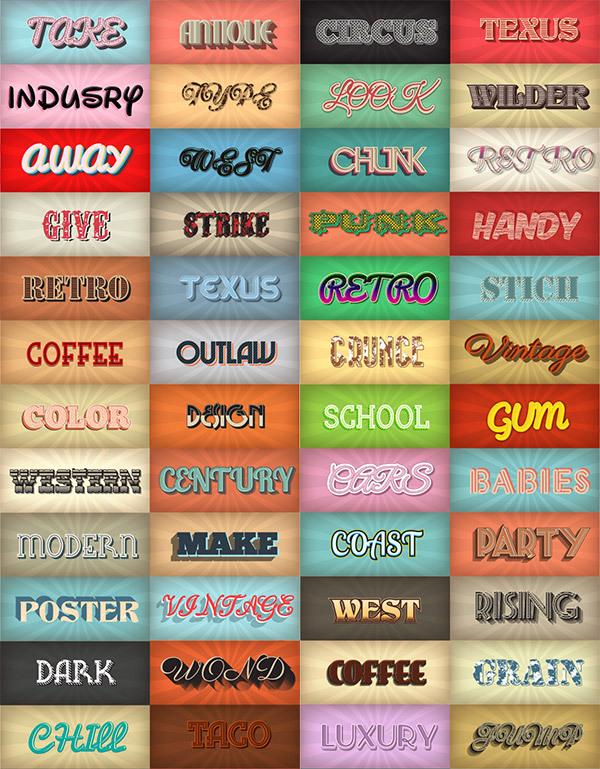 You can apply these styles to your text/artwork with just one click. 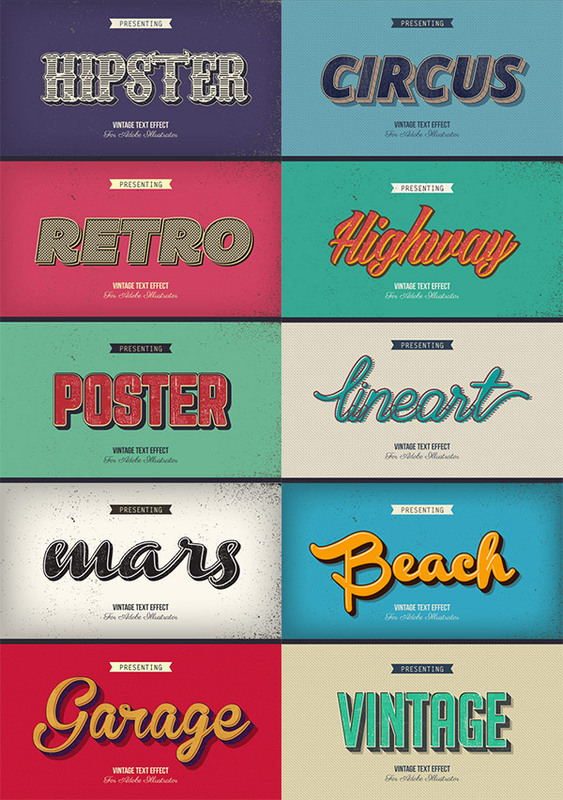 The main file contains 10 styles for text and 5 styles for background for a total of 15 graphic styles. If you love a stitch effect to your texts, then this premium is perfect for you. It also includes 60 PNG files in 2000x2000px. This pack contains 11 AI files, 10 JPG files, and a PDF file with documentation on how to use these styles. 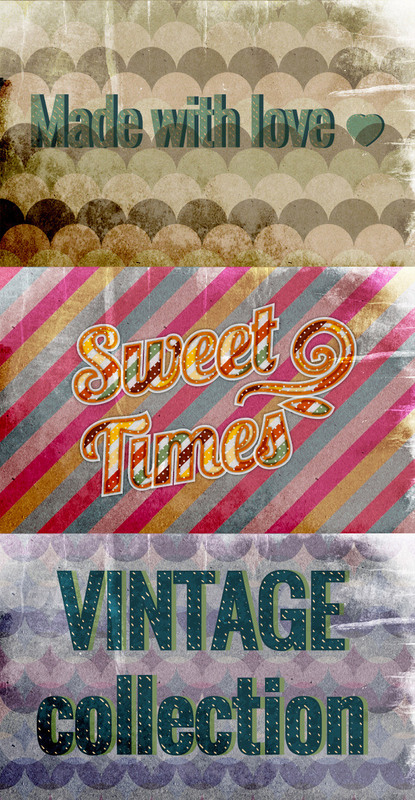 This pack will give you a total of 20 vintage text effects with 7 vector patterns in AI format. Easily mimic the look of misaligned, off-set print with these retro styles. 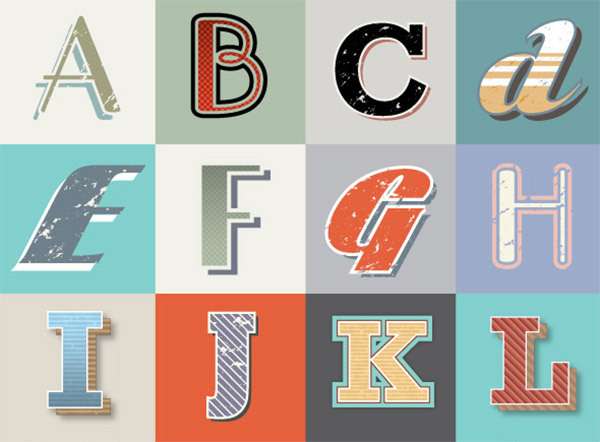 Here are 8 high quality vector styles for Illustrator CC. 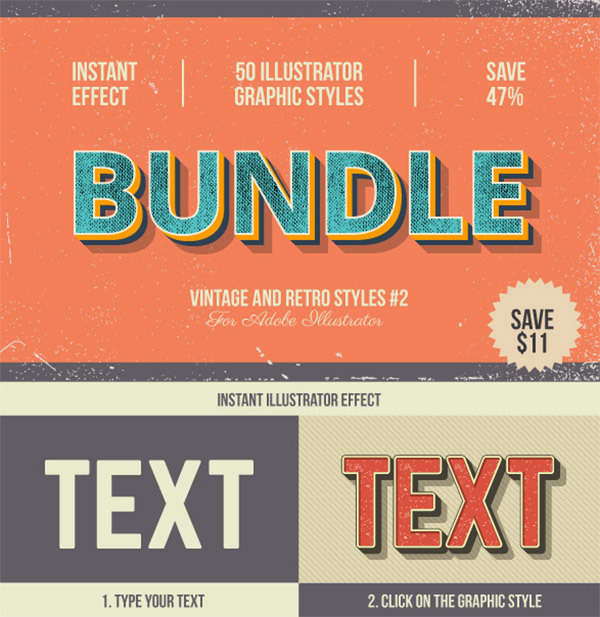 This Bundle contains 50 Retro-Vintage Styles that can be easily applied to your design through Adobe Illustrator. 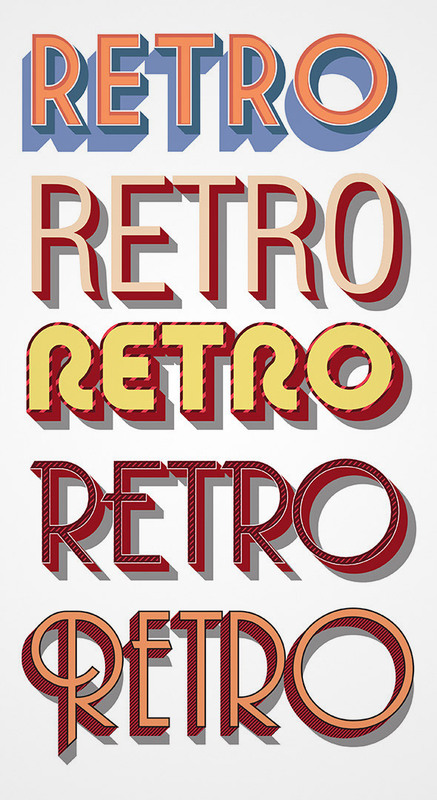 Here we have a set of 5 clean retro text styles in AI for Illustrator CS3 and EPS10 files. 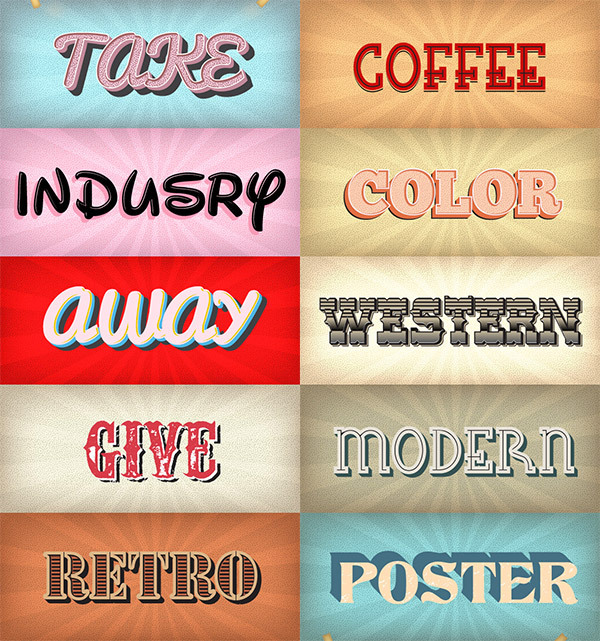 This pack includes 11 AI files of these beautiful retro styles and a help file as well. 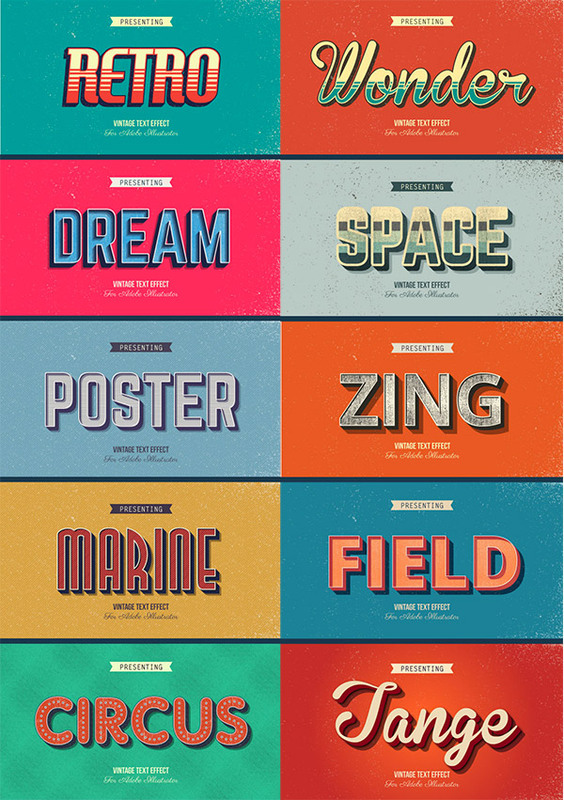 These styles are suitable for poster, typography, web, banner, illustration or your next project. 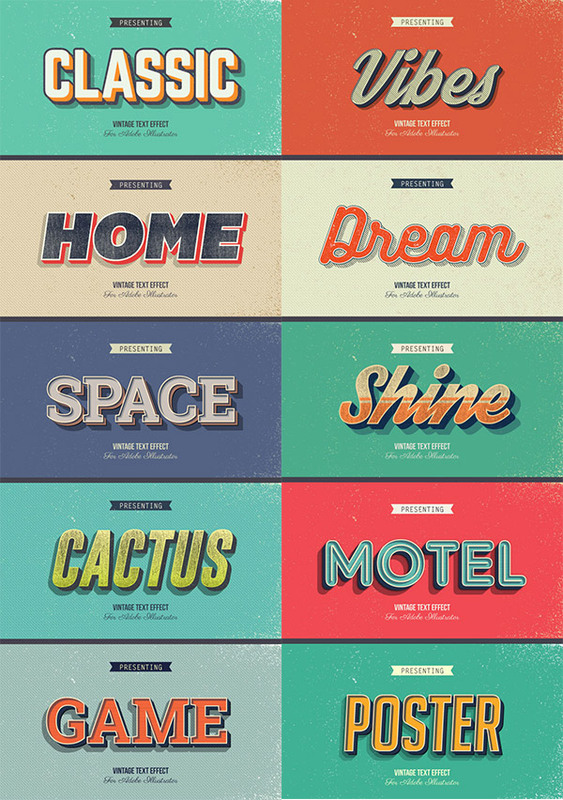 This set has 8 styles that you can use for design projects. It includes 1 AI file that contains the 8 text effects and a help file for instructions. 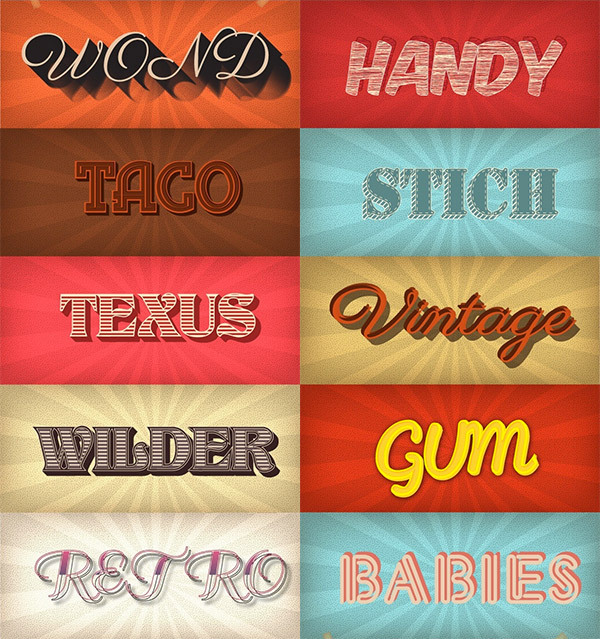 These 12 styles are easy to customize and can be used for text as well as vector images. It also comes with 40 patterns and instructions on how to use them. 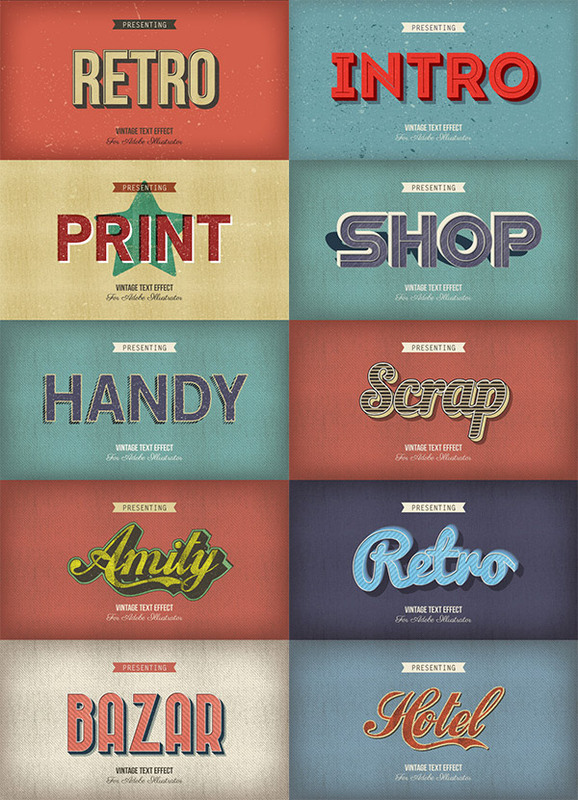 This pack carries 10 various vintage and retro text styles that can be used for any graphic, web, and app designs. 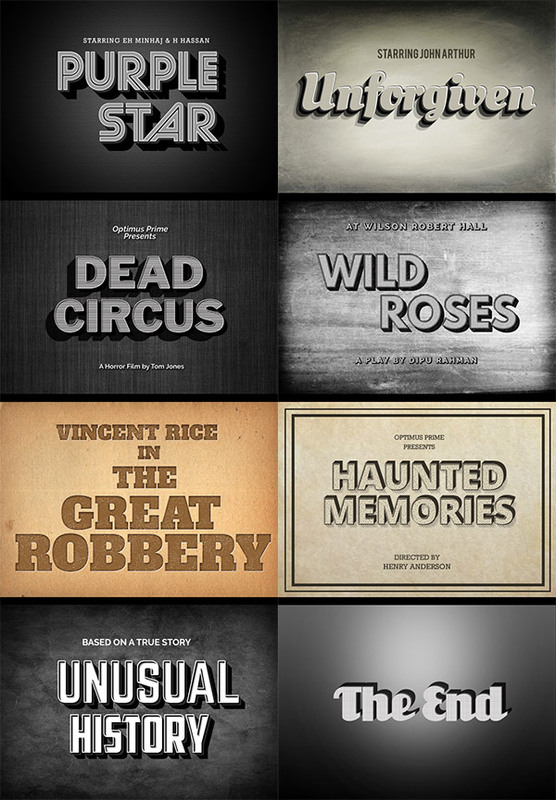 This set offers 9 movie-inspired vintage styles with vector quality. It is compatible to Adobe Illustrator CC and later versions. 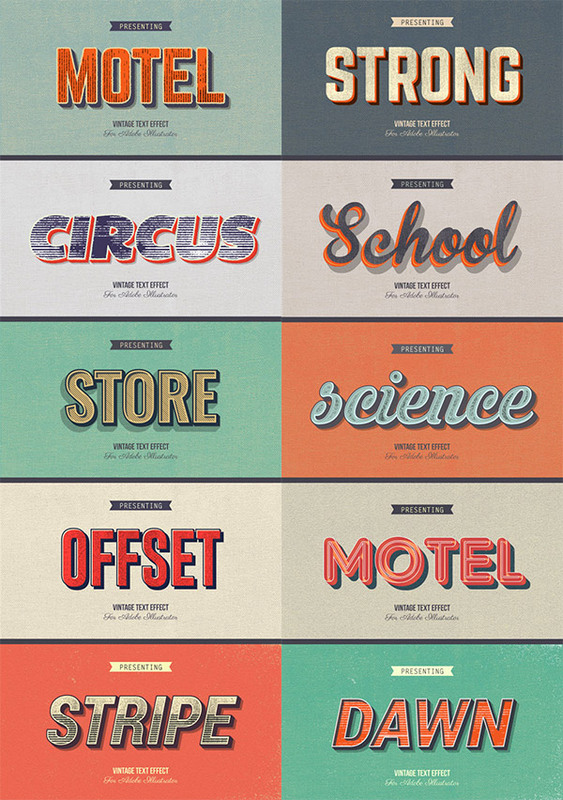 This pack holds 10 styles that can be applied to texts and vector shapes. It also has 10 backgrounds that you can add to your designs. This pack will get you 28 styles plus seamless patterns that you can apply on your projects through Adobe Illustrator CS6 and later versions. This next feature also gives 10 stylish effects with various textures that can add some kick to your design. 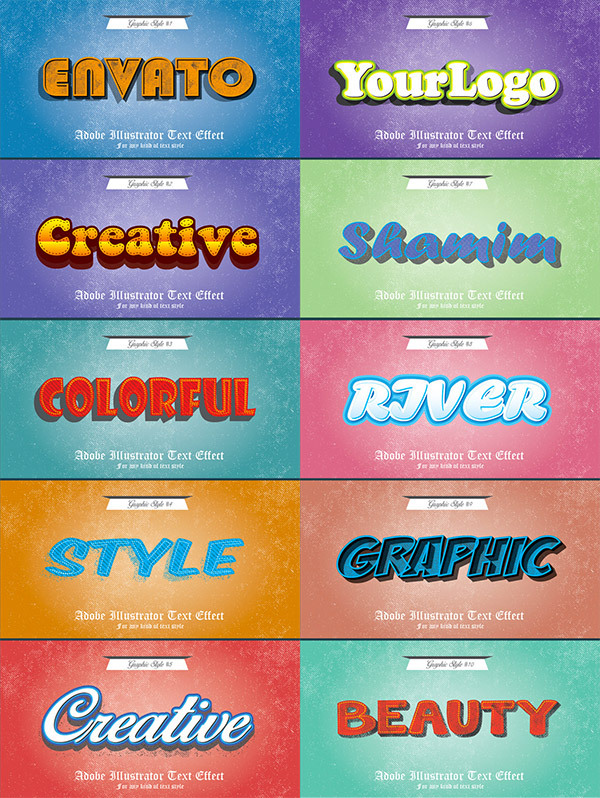 The main file contains 10 graphic styles for text that are very easy to apply, just one click away. These set gives 10 various styles that are applicable for texts and shapes. It also comes with 10 bonus seamless backgrounds that you can also use for your designs. This next feature offers 20 text styles and 20 background styles for a total of 40 styles for you to use for your design projects. 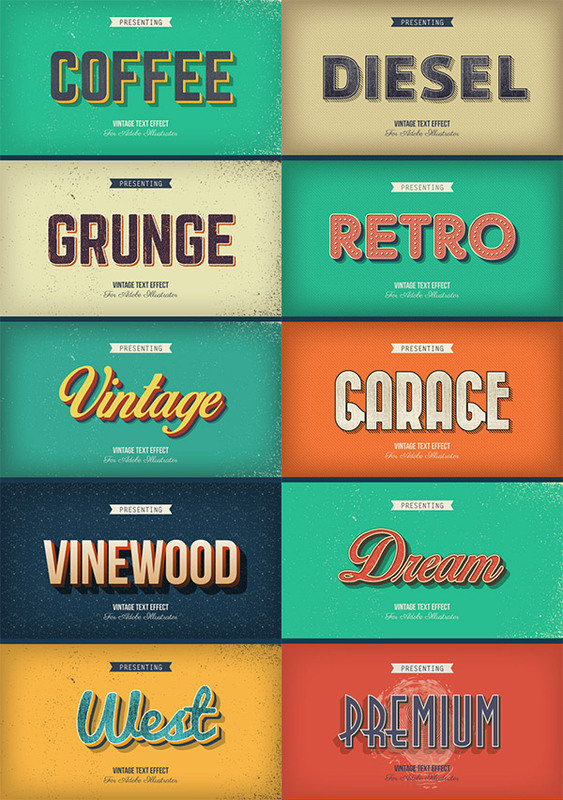 Here is a huge pack that contains 50 various graphic styles with vintage/retro designs. 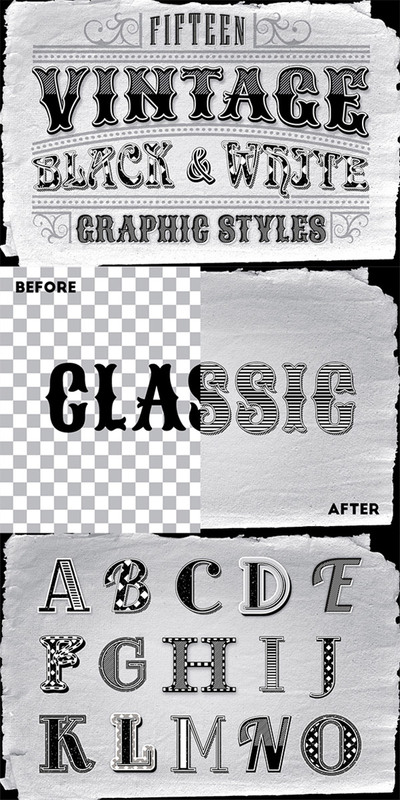 This pack will definitely give your designs an old-fashioned, classic look with ease. This last pack of the list contains 2 AI files and an EPS file that holds 10 well-designed styles.